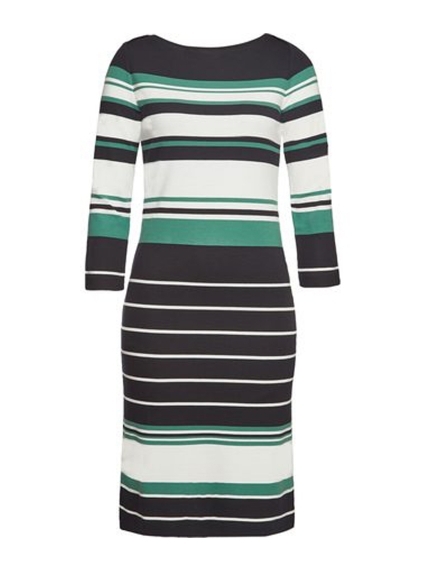 We love the versatile Elsara Dress by Hugo Boss, which is at once weekend-ready but would still look the part 9-5. Crafted in a smooth, stretch interlock jersey for a figure-slimming silhouette, the 3/4 sleeves, overlapping boat neck and playful new-season stripes complement this season's maritime trend, while a detachable sailor-knot-style rope belt with branded metal ring adds nautical flair. Simply add feminine sandals to this striking midi dress for a chic, contemporary look.